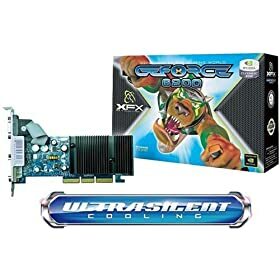 XFX PVT44AWANG GeForce 6200 256MB GDDR2 AGP 4X/8X Video Card (VGA/DVI/S-Video); 128-bit graphics processing unit (GPU) for AGP, Supports Microsoft DirectX 9.0 Shader Model 3.0, High-definition MPEG-2 hardware acceleration, High-quality real-time video recording, Provides HDTV DVI port for resolutions up to 1024 x 768. NVIDIA CineFX 3.0 technology enables stunning and complex special effects, while next-generation shader architecture delivers faster and smoother game play. Intellisample 3.0 technology offers the industry's fastest antialiasing delivers ultra-realistic visuals, with no jagged edges, at lightning-fast speeds. The combination of high-definition video processors and NVIDIA DVD decoder software delivers unprecedented picture clarity, smooth video, accurate color, and precise image scaling for all video content to turn your PC into a high-end home theater.